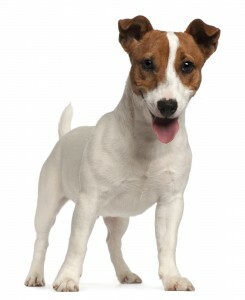 The Jack Russell terrier is a strong, agile, active working terrier with great personality. Its name implies a size of 10 to 15 inches (25 to 38 cm) at the withers; it is mainly white-bodied with smooth, rough or broken hair. There are two versions of Jack Russell’s – the Parson Russell terrier with a standard size of 12 to 14 inches (30 to 36 cm) and the Russell terrier with a standard size of 10 to 12 inches (25 to 30 cm) at the withers. Although their body is relatively small, their endless energy, character and fearless nature make them more demanding than many larger breeds. They demand an exceptional amount of outdoor activity, brain stimulation and attention, and if his needs aren’t met he will start exhibiting negative behaviors. The history of the Jack Russell terrier heads back to the 19th century when they were especially bred for hunting earth dwelling animals. This breed is named after Reverend John Russell from Devonshire, England, who was a passionate fox hunter. He bred his strain of terriers with specific body characteristics and personality, best suited for fox hunting. Their size is similar to that of a fox, so they can enter any hole where a fox could go; they are predominantly white so they can be easily distinguished from the pray; they are intelligent and brave so they can outsmart a fox. This breed wasn’t bred with attention to size, color or fur type, it was developed to correspond to the needs of hunting. Parent clubs of these breed and passionate breeders and hunters preserved this breed and its working abilities so they are similar to how they were 200 years ago. This energetic breed makes a great working dog and companion. They demand a lot of exercise and stimulation for their intelligent minds. They are active, brave, confident and friendly. Originally they were bred for hunting fox and other small quarry such as badger, groundhog and squirrel. Today they are used for hunting, search and rescue, as dog actors and in other various jobs. They are also great sport dogs for agility, racing, fly ball and Frisbee. The Jack Russell is a great pet for active people and families. If a dog is well-trained and socialized, it can be good companion for a child who knows how to behave around the dog. It will not tolerate any abusive behaviors from a child, so a Jack Russell is not recommended for kids under the age of 6. Jack Russell’s are not suitable for low energy people. It is recommended to socialize Jack Russell’s from an early age so they don’t become aggressive toward other animals. Obedience classes are recommended because they can be stubborn and require consistent training. Due to their incredible amount of energy, they are not recommended for apartments and city centers, although they can adapt if they are provided with enough exercise. Their energy, intelligence, fearlessness,and tendency to barking are great characteristics for their primarily usage, but can be seen as bad behaviors in non-working dogs. To control unwanted behaviors they need firm but gentle guidance and sufficient outdoor activity. There are three different types of coat in Jack Russell’s—smooth, broken (between smooth and rough) and rough (wire) and all should be weatherproof. It should be predominantly white (at least 51%) with black and/or tan markings. Tan markings can range from lightest tan to richest tan. Smooth and broken coated Jack Russell’s are frequently shedding and require weekly grooming. Rough hair should be plucked and stripped regularly rather than cut. Stripping off dead hair assures a healthy, firm coat while cutting leaves dead hair in the skin which can result in uneven growth of hair. If a Jack Russell is cared properly, it can live a long (15+ years), healthy life. Generally they are considered a healthy breed. According to the American Kennel Club (AKC), the Jack Russell terrier, as an official breed, doesn’t exist. 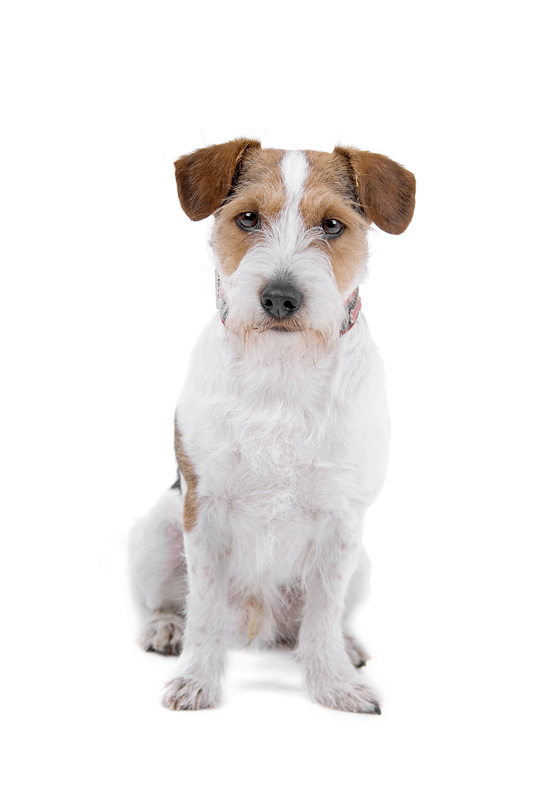 The AKC recognizes Russell terrier and Parson Russell terrier, two similar breeds with differences mainly in height and proportions, read more about them below. The Jack Russell terrier is recognized by the FCI (The Fédération Cynologique Internationale/ the World Canine Organisation) and its standards are the same as the AKC’s standards for the Russell terrier, and by the FCI, the Parson Russell terrier is a separately recognized breed. As described below, the breeds are similar; we’ll mostly state what differs them from each other. All above stated characteristics apply both to the Russell terrier and the Parson Russell terrier. The Russell terrier (AKC) or Jack Russell terrier (FCI) is small, active working terrier used primarily for fox hunting. The ideal size is 10 to 12 inches (25 to 30 cm) at the withers, slightly longer than tall, strong, active and agile, with weight proportioned to height. The skull is flat and moderately wide, decreasing in width to the eyes, stop is well defined but not overly, and muzzle is relatively wide. The length of a muzzle, from the nose to the stop, should be slightly shorter than the length from the stop to the occiput. The nose should be black and the jaw should be strong with a scissor bite. The ears are V-shaped, button or dropped. The eyes should be dark and almond shaped with a keen and intelligent expression. The neck is strong and relatively long so the dog can reach further than its fore-paws. The chest should be deep rather than wide. Paws are rounded and padded with moderately arched toes. The tail should be set high and erect and, if it is docked, the tip of the tail should be on the same level as the ears. The Parson Russell terrier (AKC and FCI) is a slightly taller, medium sized working terrier also used for fox hunting. The ideal height for males is 14 inches (36 cm) and for females 13 inches (33 cm) at the withers with weight between 13 and 17 lb (6 to 8 kg). The height at the withers is slightly longer than length from withers to the base of the tail. The head is in proportion to the body, skull is flat with wide muzzle, stop is well defined. Almond shaped, dark brown eyes express intelligence and courage. Ears are relatively small, V-shaped and dropped. Neck is muscular, gradually widening into the shoulders. The body should be relatively squared and balanced, agile and flexible. The tail should be strong, preferably straight, and carried up on the move.